A parallel measurement with a Wild screen and a Stevenson screen in Basel, Switzerland. Double-Louvre Stevenson screens protect the thermometer well against influences of solar and heat radiation. The half-open Wild screens provide more ventilation, but were found to be affected too much by radiation errors. In Switzerland they were substituted by Stevenson screens in the 1960s. We are building a database with parallel measurements to study non-climatic changes in the climate record. In a parallel measurement, two or more measurement set-ups are compared to each other at one location. Such data is analyzed to see how much a change from one set-up to another affects the climate record. This post will first give a short overview of the problem, some first achievements and will then describe our proposal for a database structure. This post's main aim is to get some feedback on this structure. Quite a lot of parallel measurements are performed, see this list for a first selection of datasets we found, however they have often only been analyzed for a change in the mean. This is a pity because parallel measurements are especially important for studies on non-climatic changes in weather extremes and weather variability. Studies on parallel measurements typically analyze single pairs of measurements, in the best cases a regional network is studied. However, the instruments used are often somewhat different in different networks and the influence of a certain change depends on the local weather and climate. Thus to draw solid conclusions about the influence of a specific change on large-scale (global) trends, we need large datasets with parallel measurements from many locations. Studies on changes in the mean can be relatively easily compared with each other to get a big picture. But changes in the distribution can be analyzed in many different ways. To be able to compare changes found at different locations, the analysis needs to be performed in the same way. To facilitate this, gathering the parallel data in a large dataset is also beneficial. Quite a number of people stand behind this initiative. The International Surface Temperature Initiative and the European Climate Assessment & Dataset have offered to host a copy of the parallel dataset. This ensures the long term storage of the dataset. The World Meteorological Organization (WMO) has requested its members to help build this databank and provide parallel datasets. However, we do not have any funding. Last July, at the SAMSI meeting on the homogenization of the ISTI benchmark, people felt we can no longer wait for funding and it is really time to get going. Furthermore, Renate Auchmann offered to invest some of her time on the dataset; that doubles the man power. Thus we have decided to simply start and see how far we can get this way. The first activity was a one-page information leaflet with some background information on the dataset, which we will send to people when requesting data. The second activity is this blog post: a proposal for the structure of the dataset. Upcoming tasks are the documentation of the directory and file formats, so that everyone can work with it. The data processing from level to level needs to be coded. The largest task is probably the handling of the metadata (data about the data). We will have to complete a specification for the metadata needed. A webform where people can enter this information would be great. (Does anyone have ideas for a good tool for such a webform?) And finally the dataset will have to be filled and analyzed. Given the limited manpower, we would like to keep it as simple as possible at this stage. Thus data will be stored in text files and the hierarchical database will simply use a directory tree. Later on, a real database may be useful, especially to make it easier to select the parallel measurements one is interested in. Next to the parallel measurements, also related measurements should be stored. For example, to understand the differences between two temperature measurements, additional measurements (co-variates) on, for example, insolation, wind or cloud cover are important. Also metadata needs to be stored and should be machine readable as much as possible. Without meta-information on how the parallel measurement was performed, the data is not useful. We are interested in parallel data from any source, variable and temporal resolution. High resolution (sub-daily) data is very important for understanding the reasons for any differences. There is probably more data, especially historical data, available for coarser resolutions and this data is important for studying non-climatic changes in the means. However, we will scientifically focus on changes in the distribution of daily temperature and precipitation data in the climate record. Thus, we will compute daily averages from sub-daily data and will use these to compute the indices of the Expert Team on Climate Change Detection and Indices (ETCCDI), which are often used in studies on changes in “extreme” weather. Actively searching for data, we will prioritize instruments that were much used to perform climate measurements and early historical measurements, which are more rare and are expected to show larger changes. Following the principles of the ISTI, we aim to be an open dataset with good provenance, that is, it should be possible to tell were the data comes from. For this reason, the dataset will have levels with increasing degrees of processing, so that one can go back to a more primitive level if one finds something interesting/suspicious. For this same reason, the processing software will also be made available and we will try to use open software (especially the free programming language R, which is widely used in statistical climatology) as much as possible. It will be an open dataset in the end, but as an incentive to contribute to the dataset, initially only contributors will be able to access the data. After joint publications, the dataset will be opened for academic research as a common resource for the climate sciences. In any case people using the data of a small number of sources are requested to explicitly cite them, so that contributing to the dataset also makes the value of making parallel measurements visible. The basic structure has 5 levels. In levels 2, 3 & 4 we will provide information on outliers and inhomogeneities. Especially for the study of extremes, the removal of outliers is important. Suggestions for good software that would work for all climate regions is welcome. Longer parallel measurements may, furthermore, also contain inhomogeneities. We will not homogenize the data, because we want to study the raw data, but we will detect breaks and provide their date and size as metadata, so that the user can work on homogeneous subperiods if interested. This detection will probably be performed at monthly or annual scales with one of the HOME recommended methods. Because parallel measurements will tend to be well correlated, it is possible that statistically significant inhomogeneities are very small and climatologically irrelevant. Thus we will also provide information on the size of the inhomogeneity so that the user can decide whether such a break is problematic for this specific application or whether having longer time series is more important. If possible, we will also store the images of the raw data records. This enables the user to see if an outlier may be caused by unclear handwriting or whether the observer explicitly wrote that the weather was severe that day. In case the normal measurements are already digitized, only the parallel one needs to be transcribed. In this case the number of values will be limited and we may be able to do so. 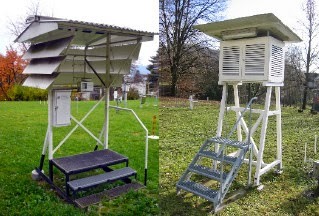 Both Bern and Bonn have facilities to digitize climate data. Even if it will be more work for us, we would like to receive the data in its native format and will convert it ourselves to a common standard format. This will allow the users to see if mistakes were made in the conversion and allows for their correction. In the beginning our standard format will be an ASCII format. Later on we may also use a scientific data format such as NetCDF. The format will be similar to the one of the COST Action HOME. Some changes will be needed to the filenames account for multiple measurements of the same variable at one station and for multiple indices computed from the same variable. We expect that an important use of the dataset will be the study of non-climatic changes in daily data. At this level we will thus gather the daily datasets and convert the sub-daily datasets to daily. Many people use the indices to the ETCCDI to study changes in extreme weather. Thus we will precompute these indices. Also in case government policies do not allow giving out the daily data, it may sometimes be possible to obtain the indices. The same strategy is also used by the ETCCDI in regions where data availability is scarce and/or data accessibility is difficult. In the main directory there are the sub-directories: data, documentation, software and articles. In the sub-directory data there are sub-directories for the data sources with names d###; with d for data source and ### is a running number of arbitrary length. In these directories there are up to 5 sub-directories with the levels and one directory with “additional” metadata such as photos and maps that cannot be copied in every level. In the level 0 and level 1 directories, climate data, the flag files and the machine readable metadata are directly in this directory. Because one data source can contain more than one station, in the levels 2 and higher there are sub-directories for the various stations. These sub-directories will be called s###; with s for station. Once we have more data and until we have a real database, we may also provide a directory structure first ordered by the 5 levels. The filenames will contain information on the station and variable. In the root directory we will provide machine readable tables detailing which variables can be found in which directories. So that people interested in a certain variable know which directories to read. For the metadata we are currently considering using XML, which can be read into R. (Are the similar packages for Matlab and FORTRAN?) Suggestions for other options are welcome. What do you think? Is this a workable structure for such a dataset? Suggestions welcome in the comments or also by mail (Victor Venema & Renate Auchmann ). The previous post provides more background on this project. An EU project to improve the meta information and therewith make climate data more easily usable. Our Wiki page listing a large number of resources with parallel data. What is a change in extreme weather? Two possible definitions, one for impact studies, one for understanding. Proposal for future research in homogenisation of climate network data. A short description of the causes of inhomogeneities in climate data (non-climatic variability) and how to remove it using the relative homogenization approach. Raw climate records contain changes due to non-climatic factors, such as relocations of stations or changes in instrumentation. This post introduces an article that tested how well such non-climatic factors can be removed. Dan Kahan, Professor of Law and Psychology at Yale, produced a remarkable plot about the attitude towards global warming of Tea Party supporters. Kahan of the Cultural Cognition Project is best known for his thesis that climate "sceptics" should be protected from the truth and that no one should mention the fact that there is a broad agreement (consensus) under climate scientists that we are changing the climate. Without having the scientific papers to back it up, reading WUWT and Co. leaves one with the impression that there are many more scientific claims on climate change that would make these "sceptics" more defensive. They may actually be willing to pay not to hear them. We could use the money to stimulate renewable energy; to reduce air pollution in the West naturally, not for mitigation of global warming that would help everyone. Maybe I should explain for the non-American readers that the Tea Party is a libertarian, populist and conservative political movement against taxes that gained prominence when the first "black" US president was elected. It is well known that members of the Tea Party are more dismissive of global warming as the rest of the Republicans or Democrats in the USA. It could have been that Tea-Party members are "more Republican" as other people calling themselves Republican. The plot below by Dan Kahan suggests, however, that identifying with the Tea Party is an important additional dimension. In fact, normal Republicans and democrats are not even that different. The polarization in the USA is to a large part due to the Tea Party. Especially, when you consider that the non-Tea-Party Republicans most to the right of the scale may still have a more tax-libertarian disposition than the ones more in the middle. For me the most striking part is how sure Tea Party members claim to be that global warming is no problem. On average they see global warming as being a very low risk, the average is a one on a scale from seven to zero. Given how close that average is to the extreme of the scale, there cannot be that much variability. There thus probably is a consensus among Tea Party members that global warning is a low risk. That was something Kahan did not explicitly write in his post. That is quite a consensus for a position without scientific evidence. I guess we are allowed to call this group think, given that many climate "sceptics" even call a consensus with evidence group think. Real conservatives are conservationists by Barry Bickmore (a conservative). "The radical libertarians’ knee-jerk rejection of the scientific consensus on climate change isn’t just anti-Conservative. It borders on sociopathy in its extreme anti-intellectualism and recklessness." A post on the extremist and anti-intellectual atmosphere at WUWT and Co. Some people seem to be willing to suffer loses as long as others suffer more. This leads to the question: "Do dissenters like climate change?"